I am listing a lot of pieces of a wonderful set of china----"Columbia", Enameled by Wedgwood. It is a very opulent pattern with great colors in hand painted enameling under the glaze. The ground is white with a center design of floral surrounded by gold griffins. The rim has an alternating pattern of gold griffins and florals, and a dark green band on the edge. The pattern is W 595. It was in production from 1924-1997. There are dinner plates, salad plates, cups and saucers, rimmed soups, a sugar, a creamer, an oval open vegetable dish, a large oval serving platter, and a teapot. 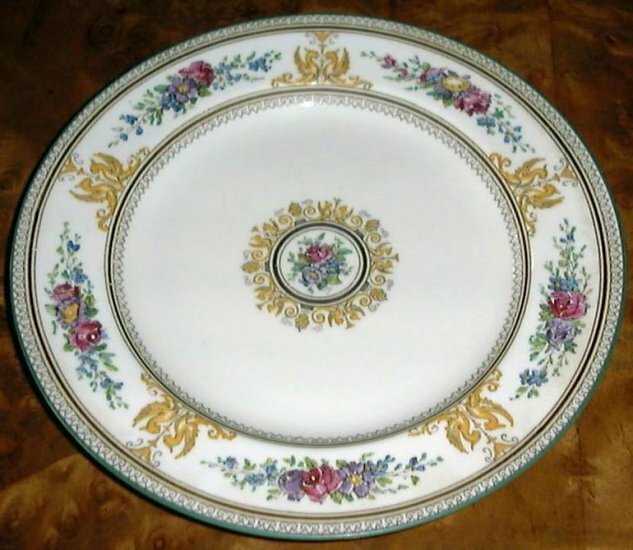 This particular 9" LUNCHEON PLATE is older than the set that is in my store, I believe. The griffins are a much brighter gold and the W 595 is only written in red ink in the under-glaze instead of being printed with the rest of the back-stamp as in the other china. FREE US shipping includes delivery confirmation. Shipping charge quoted is for insurance only. If you came to my site from Google or froogle, go to my store web address http://somethingold.ecrater.com to see my entire collection. When you are on MY site---not eCRATER's, click on the links at the top and the bottom right of the page, ESPECIALLY the "terms" link. And did you know that if you click on the photos, they will enlarge? Remember "Something Old" when you need special, unique gifts or just something wonderful for yourself!